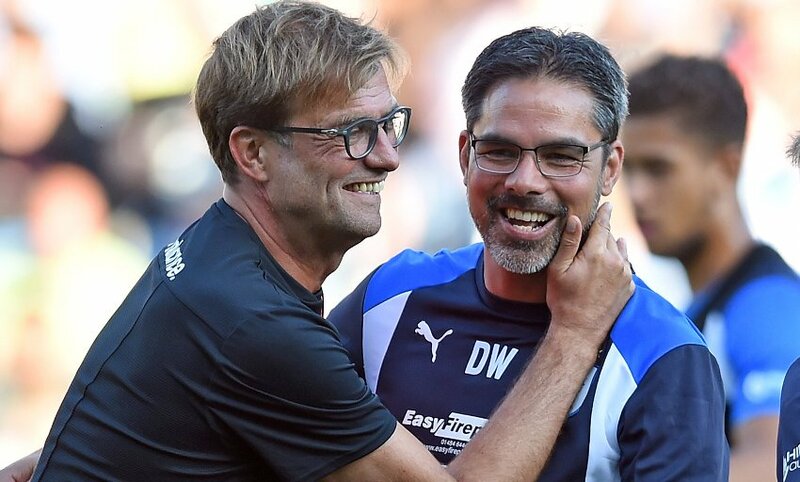 Liverpool travel to the John Smith's stadium on Saturday evening as David Wagner welcomes his former boss and long-term friend Jürgen Klopp to West Yorkshire. Liverpool will look to return to winning ways against Huddersfield Town on Saturday in their quest to claim their first ever Premier League title following back-to-back draws against fellow unbeaten foes Manchester City and Chelsea. The Reds 100% start to the season was halted before the international break and Jürgen Klopp will be determined to maintain the pressure on his title rivals. Meanwhile, his former Borussia Dortmund colleague and good friend David Wagner is still searching for his first win of the season following the Terriers miserable start in their second season back in the top flight. The hosts' previous result saw them earn a brave point against Burnley at Turf Moor when Christopher Schindler fired his first ever Premier League goal to share the spoils. The Reds will be hoping to bounce back from their 0-0 draw with the Citizens a fortnight ago when Riyad Mahrez dramatically missed a late penalty to keep the Merseysiders unbeaten league record still intact. Klopp's side will also be boosted by the fact that Liverpool are returning to a ground they haven't been defeated at since 1959. Liverpool did the double over Wagner's troops earning successive 3-0 victories over the Yorkshire outfit. This will be the 78th meeting between the two sides and the third between close friends Klopp and Wagner. Astonishingly, it is the Terriers who hold the superior record with 31 wins to their name against the Reds. Liverpool have only come out on top 29 times with 17 draws between the two. However, Huddersfield are yet to see victory against the Reds in the Premier League and are still searching for their first domestic win since April. The Terriers are only one of three teams without a league victory this campaign, but, also possess the worst tally in front of goal, only finding the net four times in eight games. Huddersfield's inability to find the net puts further emphasis on their ability to defend and frustrate a Reds side that scored a staggering 135 goals in all competitions last campaign. With Liverpool likely to see one or two members of their front three left out due to injury it could prove the perfect opportunity for Daniel Sturridge to continue his remarkable start to the season. The Reds' player of the month for September will first have to get past Town's colossal giant Mathias Jørgensen. The 6ft 3 centre-half will be hoping to keep Sturridge quiet, and considering Huddersfield have only kept one clean sheet all season it will prove a mammoth task for the Terriers back-four to keep this free-flowing Liverpool side at bay. Long-term absentee Terence Kongolo is out until November with a thigh injury, but, Wagner is hoping to have Ramadan Sobhi available following the international break. Aaron Moy (groin), Danny Williams (knee) and Tom Smith (hip) are to be assessed in the coming days and could still feature for Huddersfield. Schindler should make the matchday squad after suffering a head injury after scoring his maiden Premier League goal. Midfielder Philip Billing is still weeks away from a return. Mohamed Salah returned from international duty ahead of schedule with a muscular injury, although the Egypt camp has been quick to insist that decision was merely precautionary and that Liverpool's talisman could still be available for selection. Virgil van Dijk also returned to Merseyside after scoring for the Netherlands against Germany in the International break. Ronald Koeman noted, however, that the Dutch captain had been playing with two broken ribs and his decision to send him home could leave him a major doubt for Saturday. Sadio Mane has undergone surgery on a broken thumb, making him another serious doubt for the weekend. The injuries continue to stack up for Klopp with Naby Keita's thigh problem another serious concern. However, Adam Lallana is edging closer to a return and could make the matchday squad.